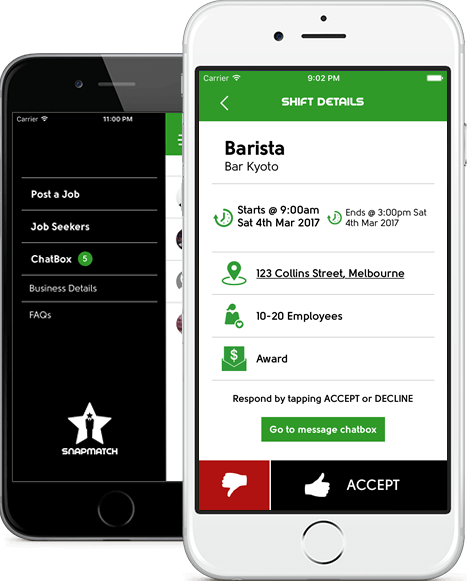 SnapMatch connects part-time, casual & temp bar jobs with employees / bar staff. Hospitality Jobs in Melbourne, Sydney, Brisbane, Gold Coast, Perth, Adelaide & Australia wide. Employers post your part-time, casual & temporary hospitality job requirements and SnapMatch will instantly provide you with suitable job seekers. Job Seekers are matched on their skills, experience, availability and location. Employers; to get started sign-up for an employer account below. Hospitality Job Seekers create a free personal SnapMatch profile letting SnapMatch and employers know when you require work. You will receive job offers that match your skills and availability. Job Seekers; to get started download our app on your iOS or Android device and create a job seeker profile. SnapMatch is continually working for you finding you a job or a hospitality employee / staff member (barista, baker, chef, cook, bar tender, bar manager, cocktail waiter, cafe attendant, caterer, event coordinator + more!). SnapMatch will make managing a shift roster easy, confirming availability and acceptance in seconds. Someone can't make their shift? Extra busy? SnapMatch fills job openings instantly with the best job seekers, someone new, someone you've used previously, you choose. SnapMatch software automates your recruitment. Job Seekers find part-time work, casual jobs & temporary jobs that meet your requirements and availability. Jobs & Job Seekers are matched based on information provided by both parties keeping everyone happy! 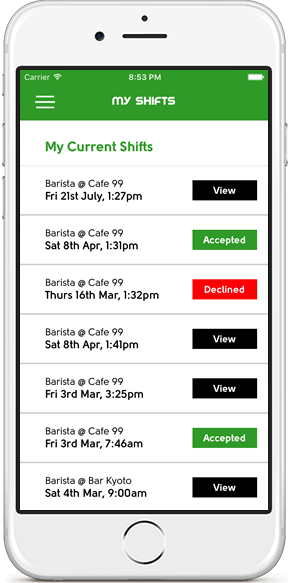 Our system enables both parties to chat, allocate multiple work shifts and accept or decline job offers directly via our app; not the right fit for you? Next please! employees receive and accept jobs via our mobile app (iOS & Android). and view private employee details via our secure web app. automated matching algorithms on an on-going 'always on' basis. your weekly hospitality jobs shift roster and even reminds you when to start. SnapMatch takes the hassle & stress out of finding suitable staff / job seekers for your job vacancies. SnapMatch provides employees a steady on-going source of quality work with reputable employers. Sign-Up today, find matches today. Part-time hospitality Jobs, Casual & Temporary hospitality Jobs in Melbourne, Sydney, Brisbane, Gold Coast, Perth, Adelaide & Australia wide. Barista Jobs, Baker, Chef, Cook, Bar Tender Jobs, Bar Manager, Cocktail Waiter Jobs, Cafe Attendant Jobs, Caterer, Event Coordinator Jobs. Now available on the Apple App Store and Google Play Store!